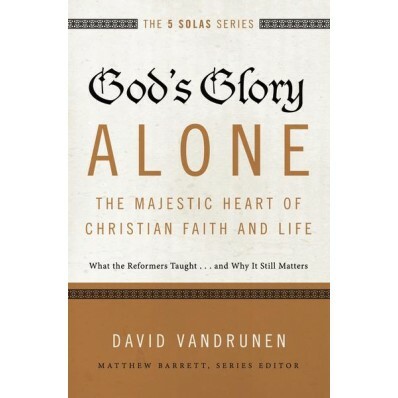 A review of “God’s Glory Alone: The Majestic Heart of Christian Faith and Life” by David VanDrunen. One evening after worship, a visitor at church asked me why we only had four of the five Reformation solas posted on our church’s website. “Which one is missing?” I asked. “Soli Deo gloria!” he responded. When I got home I checked the website. And sure enough, I had forgotten the glory of God. This was probably just a cutting and pasting error, but my embarrasment has become a reminder for me of how easily we forget the glory of God. Although we claim that our chief end is to glorify God, often we are mostly concerned about ourselves. And even when we rally around the motto soli Deo gloria our focus tends to be more on who we are and how we act, than on who God is and how he acts. This is one of many helpful insights that David VanDrunen makes in his new book, God’s Glory Alone: The Majestic Heart of Christian Faith and Life. It’s not that we shouldn’t try to do everything to the glory of God, we should—”whatever you do, do all to the glory of God” (1 Corinthians 10:31). The problem is that in our doing we forget to “recognize our call to glorify God for what it really is: God’s work in us so that he manifests his glory through us” (p. 39-40). If a work is to be truly good and glorifying to him, it has to start and end here, that is, with God. If you want to embrace a more God-centered version soli Deo gloria in their theology and in their lives, VanDrunen’s book will serve you well. I first read this as a draft and later received an advance copy from Zondervan—which is set for release next week on December 1—and having read it twice now, I highly recommend it. The book is a part of the new 5 Solas Series edited by Matthew Barrett. In this particular volume, VanDrunen opens up soli Deo Gloria—the one sola that “appears to be a bit of an outlier” at first, but is actually the “lifeblood of the solas,” and the one that puts the others in perspective (p. 14-16). The first two chapters explain soli Deo Gloria from a theological perspective. VanDrunen considers how soli Deo gloria relates to the other solas and how the subject has been treated in Reformed theology. He insightfully touches on Martin Luther, John Calvin, Edward Leigh, Jonathan Edwards, Herman Bavinck, the Westminster Standards, and a number of contemproary and popular theologians. In chapters three through five, VanDrunen opens up the Scriptures and shows how ubiquitous God’s glory is as a biblical theme. Striking images and important moments in history are brought to mind. After reading these chapters you might conclude that the revelation of the glory of God in Jesus Christ is the theme of the Bible. And you would be right. The final three chapters explain in some detailed ways how the glory of God should effect our daily lives. These chapters are titled Prayer and Worship in an Age of Distraction, The Fear of the Lord in an Age of Narcissism, and Glorifying God in an Age That Is Passing. These chapters present biblically rich ways of thinking and patterns of living that naturally lead to further reflection and application beyond the specific examples VanDrunen gives. God’s Glory Alone proves that soli Deo gloria is not an empty phrase. It is a motto filled with meaning. Its implications for life are vast, but it is more than a way of life. It is also a way of describing life—all of it—as it is lived and known in God. It humbles, it emboldens, and it leads us to worship. And all for his glory alone.